EVA Air will launch flights to three more destinations in Japan in 2019, complementing the eight gateways it serves now. Subject to government approvals, EVA will initiate flights from Taoyuan International Airport near Taipei, Taiwan to Nagoya, Aomori and Matsuyama, starting in the second quarter and continuing through the third. 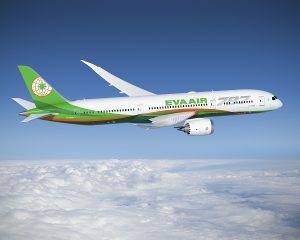 Travelers can learn more about EVA’s schedules, easy connections and services or book flights, on the airline’s website at www.evaair.com. During the third quarter of 2019, EVA will introduce service from Taipei to Aomori and Matsuyama. At the same time, it will increase capacity to Tokyo Narita, Osaka, Okinawa and Sendai by adding more flights on existing routes and deploying larger aircraft. After all of the airline’s new Boeing 787 Dreamliners have been delivered, EVA will boost its combined flight capacity to its routes to Japan by more than 10%. Nagoya is a main economic and transportation hub in central Japan and it’s near cultural attractions such as Tateyama Kurobe Alpine, Gassho Zukuri Folk Village, Hida Takayama, Toyama, Kanazawa and more. EVA currently operates 122 scheduled flights between Taipei and Tokyo, Osaka, Sapporo, Hakodate, Sendai, Komatsu, Fukuoka and Okinawa. It also provides 117 weekly chartered flights to Aomori, Akita, Fukushima, Kumamoto, Matsuyama, Nagasaki and Tokushima. In 2019, after EVA extends its network to Nagoya, Matsuyama and Aomori, it will be offering 146 weekly flights to Japan.